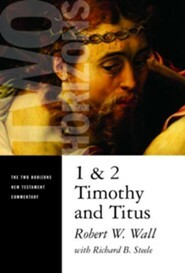 Seeking to bridge the existing gap between biblical studies and systematic theology, this distinctive series offers exegesis of the New Testament texts in close conversation with theological concerns. Written by respected scholars, THNTC volumes aim to help pastors, teachers, and students engage in deliberately theological interpretation of Scripture. 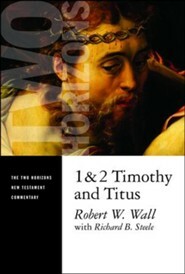 This theological commentary on 1&2 Timothy by Robert Wall powerfully demonstrates the ongoing relevance and authority of the Pastoral epistles for the church today. Wall uniquely employs an apostolic "rule of faith" methodology for interpreting these texts as sacred Scripture. Three successive historical case studies by Richard Steele vividly instantiate key themes of the pastorals. This innovative yet relevant volume will help revive the interest of students, pastors, and other Christian leaders in the Pastoral Epistles. I commend Rob Wall for offering us, and the wider church, his canonical readings of the Pastoral Epistles. Rob does not shy away from the many tough passages in these letters, always trying to present what he sees as the 'plain sense' of the text in relation to other historical, ecclesial, and cultural understandings. The combination of commentary and reading by the 'rule of faith'--supplemented by three interesting case studies--provides a thorough canonical understanding of these crucial letters from the standpoint of one who is immersed in what it means to understand the Bible as the church's book. Those of us who are long-standing admirers of Rob Wall's work will recognize that the Pastoral Epistles, with all of their critical baggage, provide the perfect backdrop for his canonical approach to Scripture. Wall never shrinks back from crucial questions. Nevertheless, he carefully and confidently interprets the Pastorals as full members of the canon. His readings are theologically apt and lively, shaped and regulated by the church's faith.